I often get asked by people how I can create a piano cover version of a song. Well, there's no simple method for sure, but there is a structure that I have made for myself that seems to work pretty well! Firstly, I would say that I'm fairly confident at playing chords, keeping in time to rhythm and have a a fairly good ear for picking out chords. Although, these are not essential skills but will make the job of learning a song much quicker. It's important to enjoy the song you are learning so that can play the song with feeling. That feeling will be felt by your listeners and you will enjoy playing the song so much more - time and time again. If you find that you don't particularly like the song after a while - or are even unsure from the start - Don't waste your time, ditch it! Every song that has been written comprises of structure including repetition, a start, middle and end. Learning in small chunks is a good way because you can repeat chords in the verses, choruses etc. and before you know it - you've learned the complete song. Most songs consist of an intro, multiple verses, multiple choruses, bridge, middle section, outro. Many songs have key changes - before a key change happens there is usually a bridging chord to allow the transition to take place - this feels like a lift in the song and it is often used in songs which are very repetitive. Then, after you transpose into a new key the chord intervals are usually the same. Sit back, relax and enjoy listening to the song a few times - just focusing on the overall sound - try not to focus on the lyrics too much and absorb all the instruments at once - similar to a relaxing yoga session. This will give you an overall picture of the song subconsciously in your mind. Ok, now find the lyrics to the song - any search of the song title followed by the word 'lyrics' should bring up the lyrics from various sites. You can always double-check the text by playing the original song and reading / singing along with the song. I usually copy the lyrics into a word doc for easy editing and printing as well as a backup! 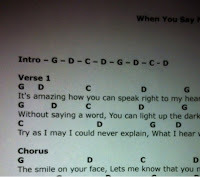 Create a space between each lyric line, this will allow you to insert chords above the text for example G F7 etc... 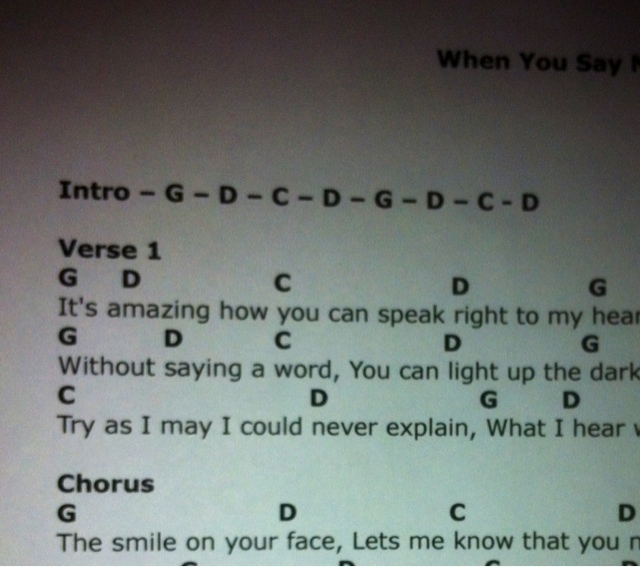 In fact, here is an example of a lyric sheet with chords. Now, if you want to condense your songsheet to one page you can try to cram two lines of lyrics onto one line. Add an apostrophe mid-way to illustrate where the second lyric line starts. It's a good idea to decide to do this before you start writing in chords otherwise it could get messy! Ok, so now you're ready to decipher the original song into a piano cover version. You'll need is a program like Spotify to play and pause your song. And, of course you'll probably want to rewind a few dozen times! Use the spacebar to pause the song when you need to. Let's get back to the chunks again and we can start playing the intro to the song. In my book, a piano version cannot copy all the rhythmic beats or clone the overall sound so think slightly out of the box and play what suits the piano! Give it your own interpretation. Play the intro and count the bars - make a rough note of that on your word doc. Now playback the track again and find the notes or chords that sound the same on the piano. As you slowly work through the piece - playing a little music, pausing it - playing the piano to find the chord - the piano chords will so emerge. As you complete a verse and chorus you'll soon realise that you are 3/4 through the song. Playback the song at the end of your work and compare the sounds of your chords to the original - If you have no changes then you are on your way to create your new version. Try playing the song from beginning to end and play the melody insync with the vocal line with your right-hand. Tricky little phrases can sometimes cause problems but as you get the flow and rhythm of the song going when you start to rehearse, this will become easier. Practice always makes perfect - play the song over and over again and try to put as much feeling into every version you play - this polishes the song into a performance. I hope you've enjoyed reading this article! Andy Montgomery. Simple theme. Powered by Blogger.